Nearly everyone loves the beach, especially kids! And now you can bring the fun and the sun of the beach into your baby's nursery crib with our fish baby bedding and fish crib bedding sets. 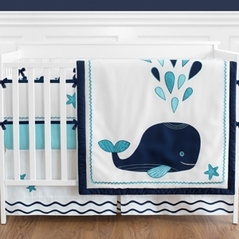 Imagine how an ocean baby bedding set like the under the sea crib bedding theme can make every day feel like a vacation day. 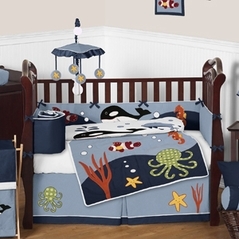 Ocean crib bedding is perfect for a little boy or girl. 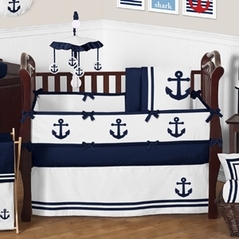 Whether you love blue skies, the warmth of the sun, the feel of the sand, or the sound of the water, you'll surely enjoy our Come Sail Away Nautical baby bedding. Don�t forget the beach accessories that can add the finishing touch to our Sand and Sea Ocean baby Bedding, we promise we�ll leave the sand at the beach! 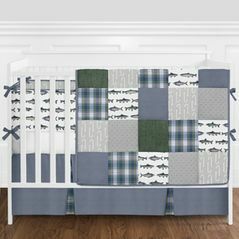 All new to Beyond Bedding is our Fish toddler bedding, which is a great choice for nautical toddler bedding or a child who dreams of living under the sea under the sheets of a sea crib bedding set. Check out our wonderful products and matching accessories to enhance the entire look and feel of your baby�s nursery room. Also make sure you take a look at other great themes, like our nursery celestial baby bedding themes with an adorable moon and stars print, or how about cowboy baby bedding for a country theme. BeyondBedding is your one stop destination for turning your child's room into a playful reflection of their personality. 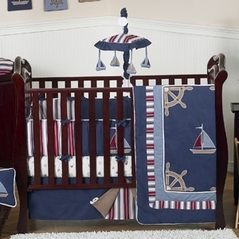 From the classic look of toile crib bedding as well as many other stylish designs, you will be sure to find something that fits your idea of a perfect baby nursery right here at Beyond Bedding even if it's not a sea crib bedding!